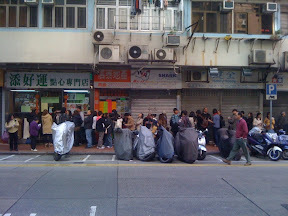 Shop 8, 2-20 Kwong Wa Street, Mong Kok, Kowloon. This was probably the most hyped and most greatly anticipated destination on the Hong Kong #fatty map. The world’s cheapest Michelin starred restaurant. 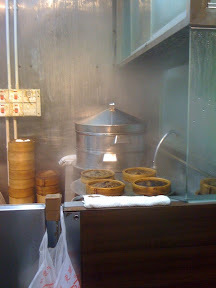 There are apparently two outlets of Tim Ho Wan now – a second one opened up in Sham Shui Po – but we went to the original in Mong Kok. We’d heard about the wait for a table, so we arrived early. 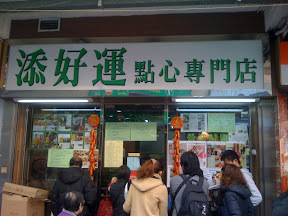 Tim ho Wan (the Mong Kok one, anyway) opens at 10am. We arrived at around 9:30, to find there was already a queue! When they started letting people in, it was clear that we weren’t all going to fit in the tiny restaurant, but thankfully we got ticket number 5, so it wasn’t going to be too long a wait. We wandered around the block, and stopped in at a herbal tea shop for something to cool our qi, after witnessing a rather heated altercation between two locals over some parking. They needed something to cool their qi too. Why the hell would people bother having a car in Hong Kong? Public transport is excellent, and cabs are dirt cheap. We arrived back at Tim Ho Wan, and they were up to ticket number three. Another five minutes later, and we were seated. All up, about a 25 minute wait. Not too bad! Oh, in case you’re wondering, if we had’ve missed our number being called, we would’ve just been given the next available table. A pretty great system, no? 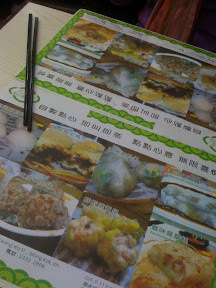 Thankfully, the place mats at Tim Ho Wan have lots of pictures of their specialties. We ticked off the items we wanted to try, after being chastised for not doing so while we were waiting outside – you can get an order form from a little box by the door – and the brusque but not unfriendly lady went off with our form. I must say, I do love a trolley service yum cha experience, but the ordering system does tend to be more efficient. We were seated up the back near the kitchen, which was at once painful – to see all of that food in such close proximity but not on our table – and cool – too see all that food in such close proximity. But that all didn’t matter so much once the food started arriving. First up was one of Tim Ho Wan’s signature dishes. Char siu bao (roast pork buns) with a difference. 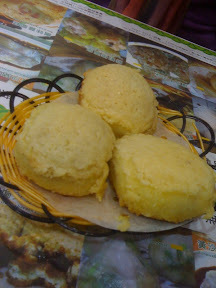 These are baked, with a crumbly cookie topping, like a smaller, filled baw law bao (pineapple buns) or Japanese melonpan. These were AWESOME! Crunchy and crisp on the outside, and choc-ful of sugar, with a wonderfully sweet-and-salty char siu filling. @eatnik and I split the third one, because neither of us was graceful – or stupid – enough to concede it to the other. Next up, the cheong fun with pork liver. @eatnik was a little apprehensive about this one, as she’s not the hugest fan of liver, but seeing as it was the only cheong fun on the menu, we pretty much had to order it. 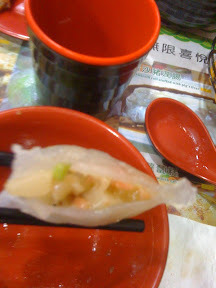 It was pretty good, though I must say the cheong fun we had in Macau was slightly more delicate, and therefore better. Still, check out how translucent these puppies were. Either that’s some expert noodle making, or someone’s cheating and adding tapioca starch to their rice flour mixture! Next up came the dumplings. First, a Qiuzhou (aka Teochew) style dumpling, with dried shrimp, peanuts and water chestnuts. I love these texturally, but I always find myself needing to dip them in soy, which I think is unnecessary when you have a good dumpling going on. 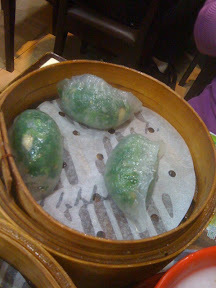 The next one was the spinach dumpling. 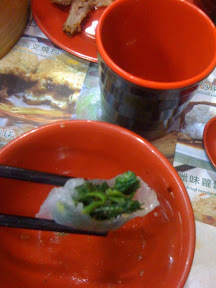 Now I was expecting a predominantly prawn-filled dumpling, with some diced spinach. This was the other way around: mostly spinach, with bits of something (was it garlic, lardons, or prawn? I don’t remember!) to add some extra flavour. Unexpected, but kind of genius. These dumplings are full of #WIN. 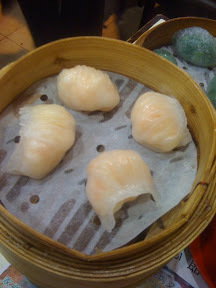 Then the classic har gow, the standard b which all yum cha joints should be judged. Ant Tim Ho Wan’s were pretty bang on the money. 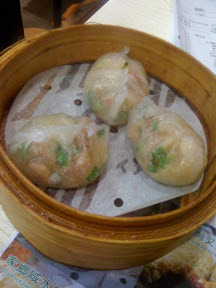 Slightly smaller than the other dumplings, so you get four, these were delicate and yet full of flavour. I applaud the inclusion of bamboo shoot, which provides a nice textural addition to the already firm and toothsome prawn meat. I’m not sure these are the best I’ve ever eaten, but they’re pretty darned good! 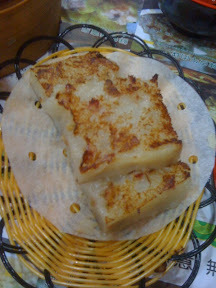 Then there was the loh baak gao. I know how to make this, and therefore am unusually critical of every one I come across. Not to say that I won’t scoff them all down without prejudice. 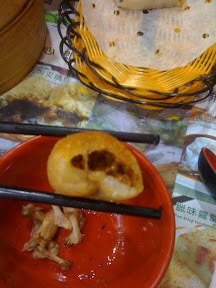 Tim Ho Wan’s version had a nice crispy sear on it, but was a tad on the crumbly side. Which is in some ways a negative, but it’s also a positive, because the crumbling texture was due to the abundance of parsnip in the mix. Hence the flavour was overwhelmingly present, which is a nice change from most loh baak gao, where you can’t taste the parsnip because it’s barely there amongst the glutinous rice flour cement. I could have done with a little more Chinese sausage in this, but overall, it was pretty good. Then, the chicken’s feet. 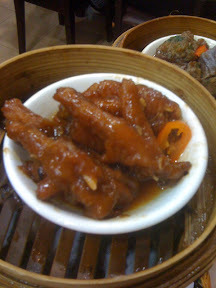 A yum cha staple, which challenges novices, and some people never get the hang/point of, chicken’s feet – or more properly foong jao (phoenix’s talons) – are another means by which I like to judge a yum cha experience. The skin – it’s all about the skin, people – should be soft and slightly saggy, and have soaked up all of the flavour in which the chicken’s feet have been braised. Tim Ho Wan’s were a little on the solid side, the collagen not having broken down enough, and the skin still sticking to the bones too much. The flavour of the braising liquid was great, but it could have done with some more time cooking. Perhaps coming for breakfast wasn’t such a great idea, as no doubt the batch of chicken’s feet would improve throughout the day. 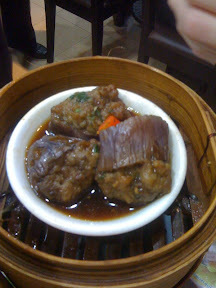 Stuffed eggplant came out next (yong ke qie). Not to be too harsh, but I wish we’d ordered something else. There wasn’t enough oil in this dish to make the eggplant soften, and while it wasn’t bitter, the eggplant had a rather off-putting taste. The filling wasn’t much to write about either, so I won’t. When the Haam sui gok (literally salty water dumplings, but better known as football dumplings here in Australia) arrived, I was excited, even though I was already starting to feel full. 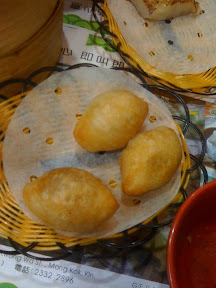 These were for a long time my favourite item at yum cha, because of the crispy shell, the yielding, gooey, sweet dough casing, and the classic salty minced pork and mushroom filling. 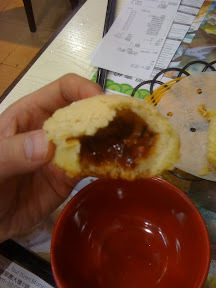 I was a little let down by Tim Ho Wan’s haam sui gok. The dough wasn’t that chewy, and there wasn’t much filling inside. Still, by that stage, it didn’t really matter, and neither did the pork and peanut congee we also ordered, which needed salt and wasn’t very amazing. So yeah, overall, it’s well worth visiting, and at around $140HKD ($20AUD at the prevailing exchange rate) for two to stuff yourself stupid, you’d have to be another kind of stupid to pass it up. 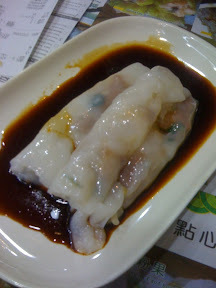 i'm pretty sure there were other cheung fun choices when i was there, hrm..
Pingback: London Eater – London food blog and restaurant reviews and restaurant guide | Tim Ho Wan, Mong Kok: Stressed Sum.